Today I wanted sparkles. So I decided to do a base of two coats Orly Liquid Vinyl and top it with one coat of Sally Hansen Strobe Light. I did two coats of Strobe Light on my ring finger as an accent. 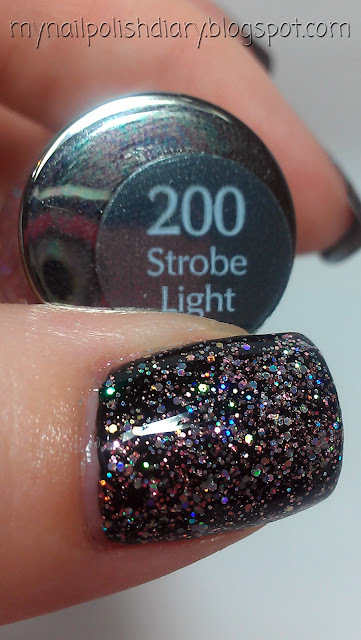 Strobe Light is silver and holographic glitter in a clear base. If I wear this again, I think I'll use Wet N Wild black creme so I only have to do one coat. By the time I was finished it ended up pretty thick. I needed two coats of Gelous and then SV quick dry coat. This look is crazy sparkly. 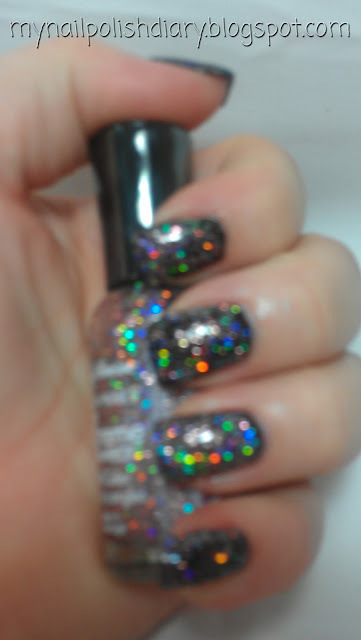 The holographic glitter is beautiful. If you want a mani that is eye catching this is the one for you. For me, I think it might be too much for my taste. I'm more of a glitter on the accent nail girl instead of the whole mani. It's pretty though. How about you? Full glitter mani or accent nail only? I have Strobe Light! It looks awesome over black. I'm totally more of an accent girl, too, but I do think I'll go all-out for the PaA challenge this coming Monday. If you've still got this on, we'll be twins! Ah, I took it off. I used the foil method lol. There was NO other way I was going to attempt getting this one off. Can't wait to see your version! Oh, I don't have Licorice. I'll have to check it out. Thanks for the tip!